The weather lately has not helped my spring cleaning mood, but I know it is right around the corner! 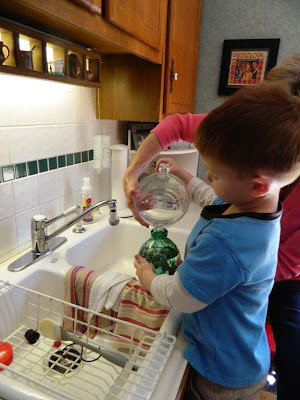 I love having my kids help with the cleaning around the house and spring is just another opportunity to help them learn about all things that we can make look fresh and new with a little elbow grease. While we visited my children's grandparents this week we noticed their hummingbird feeder needed a little love. We can't forget about our feathered friends during all our Montessori spring activities! As we prepare for the arrival of spring (and with a big move behind us), the kids and I have been doing a lot of cleaning and sorting. This week we decided to help the kids' grandparents with cleaning their hummingbird feeder. I read in an article, Preparing for Spring Bird Feeding, that migrating birds, such as hummingbirds, welcome a good snack when they settle into a new area after their long journey from warmer weather. What a great way to continue our spring cleaning! We started our project by taking down the dirty hummingbird feeder from outside and filled our sink with warm water. We placed a dish towel in the bottom of the sink to be sure we didn't accidentally crack the feeder. 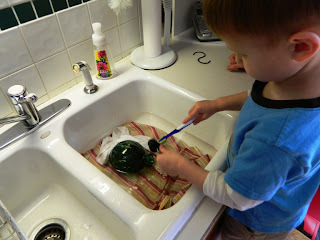 Samuel used an old toothbrush and rag to clean the inside and outside of the feeder and the rubber stopper. I used a couple Q-tips to get the smaller areas inside. 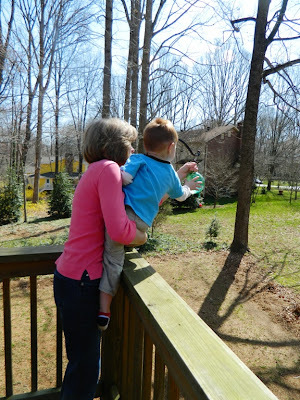 We, of course, want to give the arriving hummingbirds a wonderful snack so we made some homemade nectar. World of Hummingbirds has a very helpful article on the best type of nectar to give hummingbirds. We used their recipe and started with 1 cup of plain white sugar. Interestingly, the article suggests not adding red food coloring to our nectar. It can hurt the birds stomachs. If you have a good feeder those hummingbirds will come even without the red coloring to attract them. 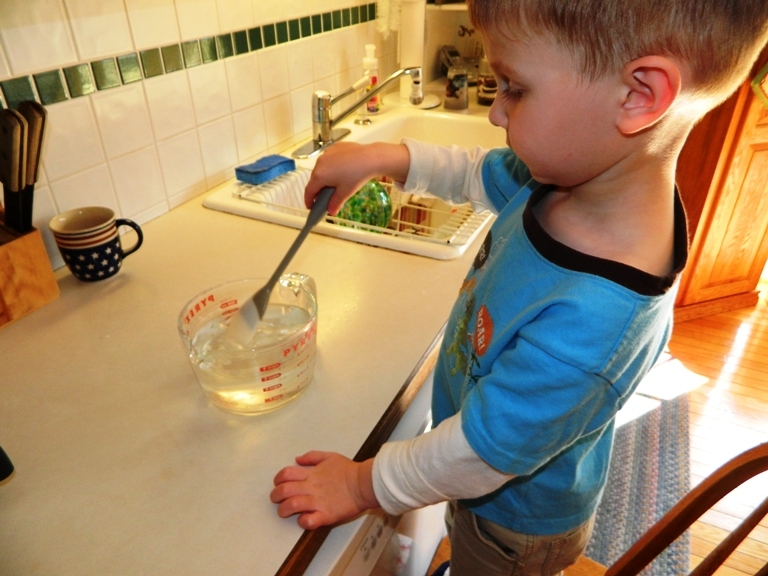 I added 4 cups of hot water to our 1 cup of sugar. We took this time to admire the steam coming off the water and talk about how careful we should be when we see steam coming off things that are hot. Samuel was especially careful while he mixed the nectar. 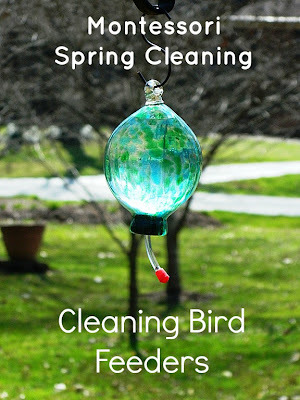 Now there is a clean hummingbird feeder ready with tasty nectar for all the hummingbirds that return from their migration. I also like the 5 Spring DIY Bird Feeder Ideas and hope to work on those projects in the next weeks. 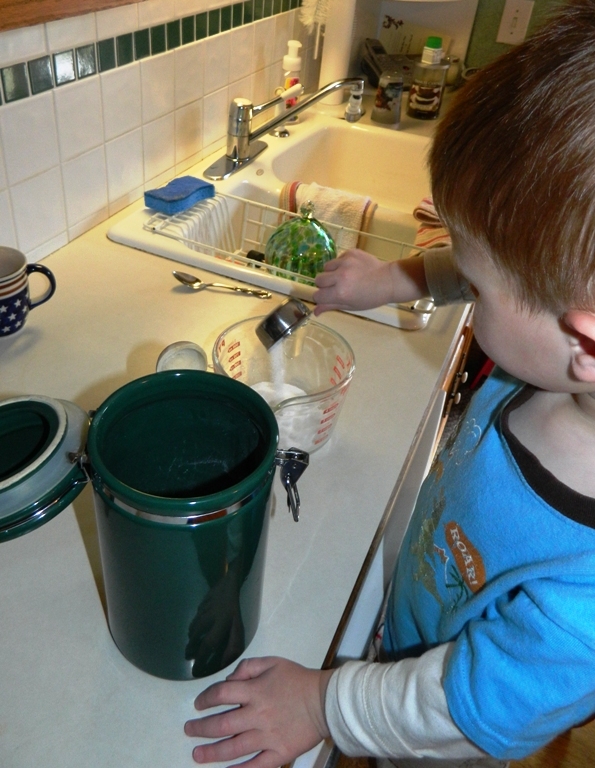 There are so many wonderful bird feeders and Montessori garden ideas on A Montessori Garden Pinterest page. I LOVE the pin on the thumb controlled watering pot and the idea about planting seedlings in eggshells! This original post published in March of 2013.